Sharesly is a new tool from DoSocial that allows you to “steal” traffic from someone else’s webpage, and drive it to wherever you want. In this case, we want it to go to our affiliate links. You first need to figure out what affiliate product or service you want to promote. In this case, I’ll be promoting SocialAdr (of course!). I head to my SocialAdr Dashboard where I can see my affiliate link. I keep this tab open in my browser for later. Now, we need to decide what you want to share with Sharesly. It helps if this content is something that could go “viral”. 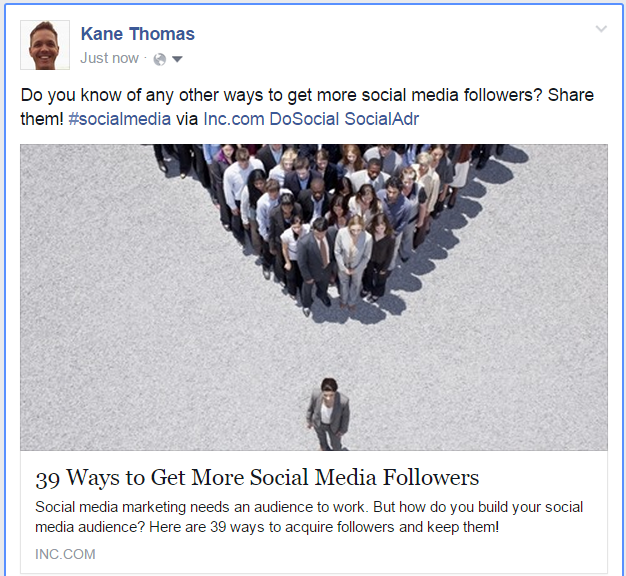 The more engaging it is, the more likely people will want to re-share it with their friends and followers. To help me find this amazing article, I head over to BuzzSumo. 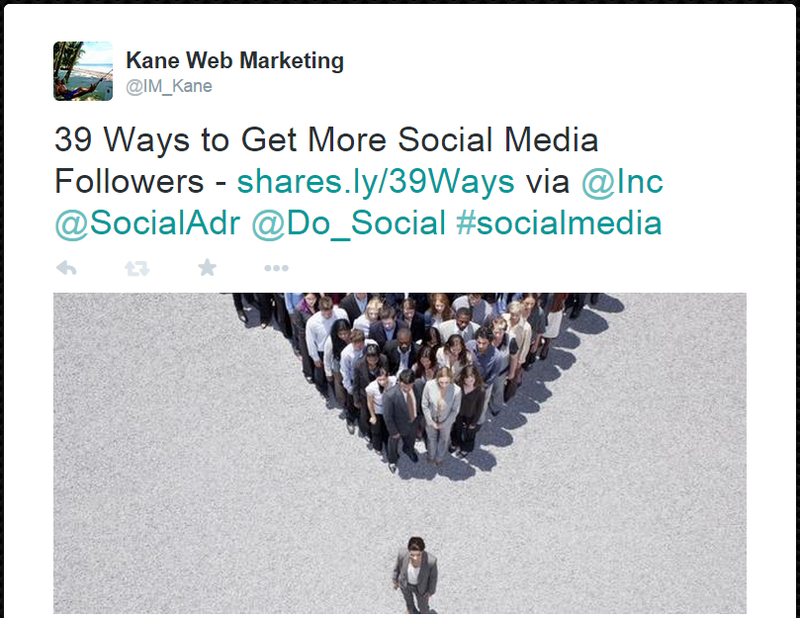 The 2nd result – “39 Ways to Get More Social Media Followers” – caught my eye. 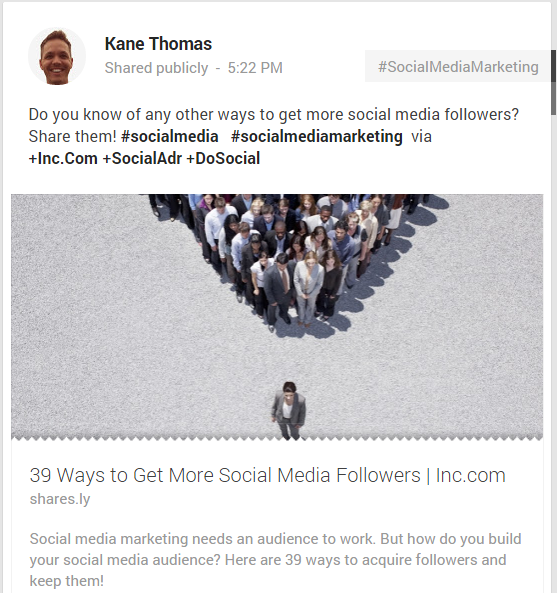 So, I copy this URL – http://www.inc.com/jayson-demers/39-ways-to-get-more-social-media-followers.html – to my clipboard. You login here, or if you don’t have an account, you can signup (for free) here. 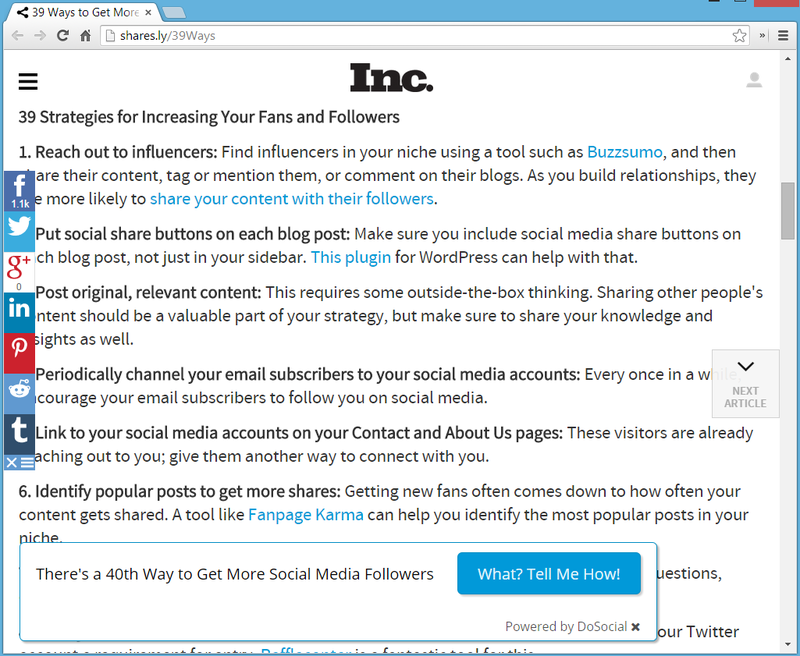 URL to Display – This is the Inc.com article URL that was in my clipboard. (time saving tip: I used the blue magic wand icon to populate the next field). Page Title – This will show up as the name of the tab in your browser. Let’s just use the same title as the Inc.com article. Popover Text – This is some verbage to catch the attention of the reader. It’ll appear in a popover in the lower left corner of the screen. In most cases you’d want to write something that’s relevant to the article. In this case I chose to write something super-relevant to the Inc.com article. Popover Button Text – This is the call-to-action text on the button that appears in the popover. You may want to use something boring like “Click here”. Or maybe something funny, or offensive…have fun with it! Button URL – This is the URL you want to send the traffic to. Enter your affiliate URL here. Custom Short Code – This is only available for the Premium DoSocial accounts. Otherwise, you’ll end up with a random string of characters in your shares.ly URL. I chose something that’s related to the article topic. Click this link and your new Sharesly page should open in a new tab. 6. Now Promote that Sharesly link! 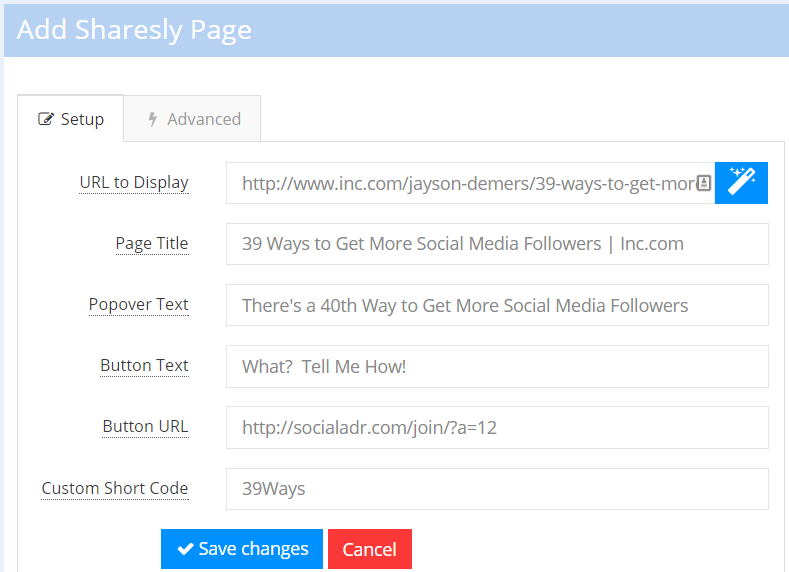 I first copy my Sharesly link – http://shares.ly/39Ways – to my clipboard so it’s handy. As far as where else to promote your Sharesly link to, that’s completely up to you. Maybe you like using Tumblr, or Pinterest, or Reddit, or you want to write your own blog post about it. The more places you can post that link, the better. Hope this helps you dominate your affiliate marketing campaigns!